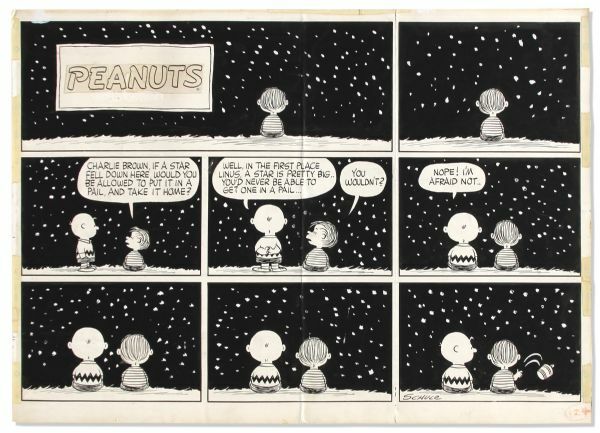 Sunday ''Peanuts'' strip hand-drawn by Charles Schulz, featuring Linus and Charlie Brown gazing upward at the stars. Large eight frame Sunday strip first appeared on 7 December 1958. In it, Snoopy and Linus humorously attempt to understand the vastness of the universe. Unique strip is mostly in black, a dramatic contrast to the white figures of Linus and Snoopy, and the white stars. Strip measures 23'' x 16.75, mounted to thin cardboard. Tape marks along edges and fold down middle. Date of strip has been whited-out, and United Feature Syndicate label has been removed. Overall in very good condition. Consigned by the family of a Professor of Astronomy, to whom Schulz gave the strip. Auction closed on Thursday, February 26, 2015.